Whenever a new cartoon flying game is released on a Nintendo platform, longtime fans immediately jump at the chance to determine if it’s a spiritual successor to the famous Pilotwings, a beloved series dating back to the Super Nintendo, but dormant since the 3DS in 2011. There are always open threads on various forums asking Nintendo when we’ll see the return of the series, and so when a contender comes to market, banking on a similar cartoon art style and with a facsimile of its name, there’s no surprise that the game will come under some scrutiny and be compared outright. Ultrawings has taken that chance to soar on the Nintendo Switch, but does it fly or does it sputter out? Ultrawings has you commanding four aircraft in total. You start with a slow and wide-sweeping ultralight aircraft and then advance to a glider. It’s not until much later that you’ll be piloting fast and maneuverable sport planes. Each of these aircraft takes finesse in flying, and some are better suited for the game’s events more than others. You’ll have to experiment to find the ones you like best. In slightly similar fashion to Pilotwings, the primary gameplay you’ll be partaking in here is navigating your aircraft through rings in various events. Additional missions will mix things up a bit by asking you to land in a specific area or shoot target balloons as you navigate your airplane, but that’s really the meat of the game. Sadly, I found these events quickly became repetitive and really wish the game had embraced more event diversity to keep things feeling fresh longer. Unfortunately flying around is where Ultrawings also starts to feel like a messy experience in general. Navigating around the archipelago islands is all done by sight, which is particularly frustrating when told to find waypoints that don’t exist for a landing event as an example. Even early on when you’re told to go find and buy your next airport location, you’ll just have to embark on an exploratory mission of your own, a mistake in which cost me fifteen minutes as I incidentally flew to the wrong island right away and was turned away with an airport cost that was far out of my league at that point in playing. As you fly around, you do have a smart phone clipped into your aircraft that ends up being used for taking photos, but I’d be remiss in saying I don’t know why they didn’t add a map to this system to help players navigate around the region far more clearly. Controls are pretty straightforward and clean. Aircraft feel responsive and indicative of their types, however players can select simulation or arcade controls, but the only difference I found was that arcade didn’t allow a plane to roll as much, which actually made it a more challenging experience to fly. Still, options are nice. While soaring through the clouds (well not actually through any clouds), you’ll see the game’s presentation is bright and colorful, with islands made out of low poly geometry and solid colored textures for the most part. It’s a decision made based on the game’s inspiration I’m sure, but it does fit stylistically well on the Nintendo platform too, and a driving factor that people will inevitably compare it to Pilotwings. I do wish I would have seen just a bit more detail in the landscapes, especially since we’ve seen this art style done exceptionally well in games like The Witness on other platforms. As mentioned, Ultrawings has a past rooted not on consoles in the traditional manner, but in VR. In fact, for those accustomed to VR games, it’s immediately noticeable from the Press Start screen that it was designed for that space, as you’re placed in a cylindrical room of sorts with secondary info on the sides of the 3D space. As this game was designed for VR, there are many instances where it’s obvious the controls were designed for that space. For example, instead of using virtual hands to trigger controls or navigate the immersive 3D menus, you’ll have to focus your cursor on HUD elements and press a button to trigger them. While not terrible, it’s just a weird feeling for this port to console. 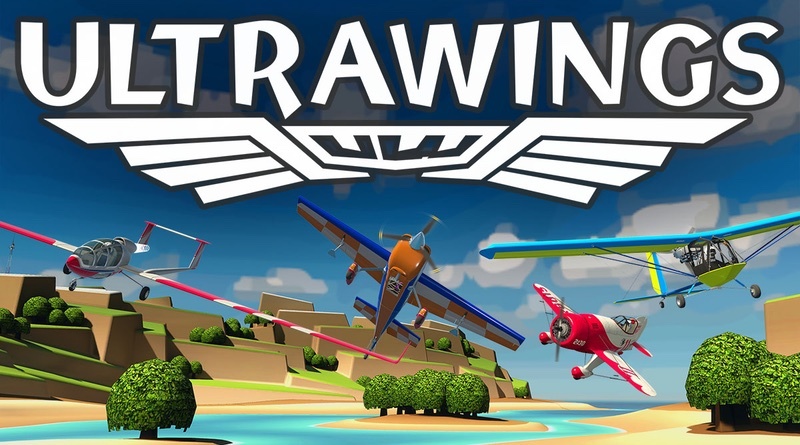 Ultrawings isn’t a successor to Pilotwings, and really shouldn’t be viewed as such, even though at face value it may be compared that way. Instead it’s a lightweight flight simulator that’s made its way onto the Nintendo Switch from the Virtual Reality platforms where it was designed for. For me, it felt a bit too disconnected as a controller game, and could have used additional polish and tailoring for the platform. It ultimately didn’t soar as high as I would have hoped. Ultrawings ports over a VR flight game to the Nintendo Switch. Unfortunately the developers didn’t tweak the controls to fit the platform, so there are some odd gameplay elements. A lack of a map means you’ll really have to enjoy your time flying over large swaths of water to reach possible destinations. Only a few event types means a redundant experience pretty early on. Flying felt good and respective of the different aircraft, but with only 4 total planes to use and lengthy unlock requirements to get them, there’s just not the right balance to make this games soar.